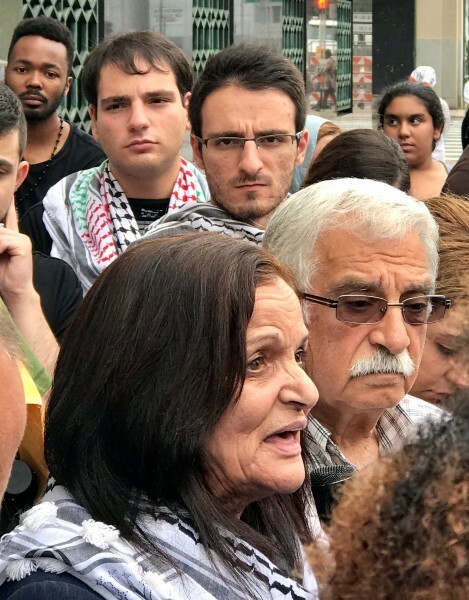 Rasmea Odeh at Detroit sentencing: ‘We will continue to struggle for our cause! We will liberate our Palestine!’ | Fight Back! Detroit, MI - Palestinian American icon Rasmea Odeh made her final court appearance in Detroit on August 17. Odeh knew the sentence before she arrived. The defense and prosecution agreed to a sentence of removal from the U.S., and Judge Gerswhin Drain approved. Odeh was looking forward to making her public statement before the court. Then U.S. prosecutor Jonathan Tukel responded by talking about terrorism charges and that she was found guilty of fraud, but failing to mention Odeh’s successful appeal. Finally Odeh was invited to speak. 150 Rasmea Odeh supporters who came to rally in pouring rain packed the courtroom and nearly filled the overflow room where they watched on large video monitors. Odeh addressed Judge Drain, saying her remarks were not directed at him personally, and she appreciated being allowed to tell her story. Judge Drain interrupted, saying the case is about false statements on applications, not about the Israeli-Palestinian conflict. There were three interruptions by Judge Drain, but when Odeh finished, the overflow room clapped and cheered for her. Odeh now must report to ICE and work out a plan with them. Fight Back! will follow and report on this as details are revealed. Odeh will spend no time in jail, Judge Drain released her bond, and she loses her citizenship prior to being deported.